1. One touch fully automatic operation. tasty creations in/about 15 minutes. 2. Stainless steel cooking chamber, grinding blades and food baskets. 4. Smart indicator light changes from red to green to indicate process is complete. cleaning. No exposed heating coil to burn you or clean. and soup gives perfect results every time. 2. 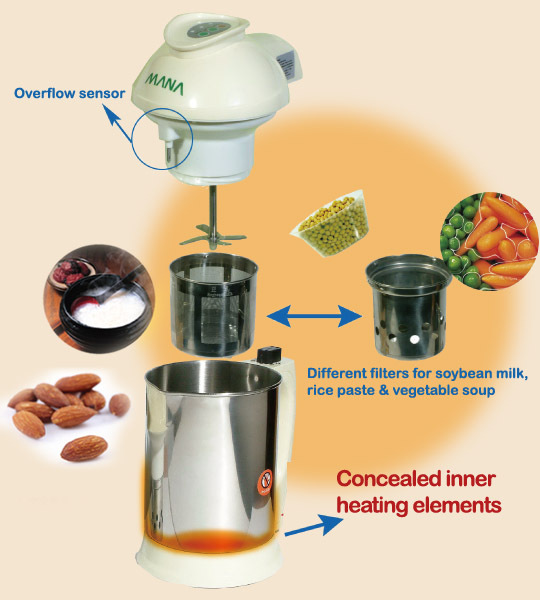 Temperature controlled cooking cycle for perfect results every time. 3. Elegant styling and compact size adapts to any kitchen decor. 4. Enjoy a great tasting, additive free and healthy drink for pennies per serving. a cleaning brush and cleaning pad for added convenience. the boiling chamber to ensure safe and reliable operation. 3. Operation-friendly with light indicators and beep sound alert. National maintenance service for the first year you buy it. For more details, please refer to the warranty card. �t�s���~�ѥ��������q ���v�Ҧ� 2010 KAWAYAMA INTERNATIONAL CO., LTD. all rights reserved.